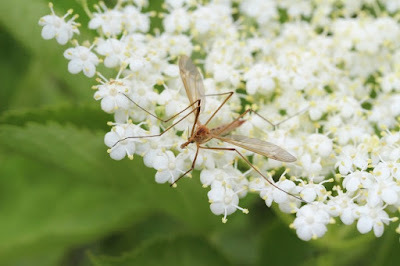 This post was almost scratched because a lot of us detest skeeters, and I did a post a spell back about the design and dangers of the dreadful things. But this one has different details to examine: their flight. Y'all can appreciate the wonders of not only science and technology, but the design work of the Master Engineer, right? For a very long time, scientists could not figure out how mosquitoes were able to fly. Like so many other discoveries that affirm creation and refute evolution, advances in science and technology made it possible to commence understanding mosquito flight — they can beat their wings 800 times a second, after all. Many components had to be in place from the beginning or it simply could not fly. At all. Ever. Evolutionists use their special system of Making Things UP™ to "explain" how maybe perhaps it could be they suspect how wings formed. As the fossil record shows, there is no evidence of evolution; a mosquito has always been a mosquito. Some people just don't get the point. In the past, zoologists (i.e., aerodynamicists) have used a procedure to monitor wing movement called quasi-steady modelling. However, for the mosquito, this approach could not “encapsulate wake capture, rotational drag and nonlinear vortex phenomena.” But the four researchers were successful in describing the “unusual wing kinematics” of the mosquito. To read the article in its entirety, click on "High Frequency Mosquito Flight Shows Design". In addition, there's another with some fascinating aerodynamic information, and how mosquito flight is being studied for biomimetics, "Science Says Mosquitoes Cannot Fly But Recently Found Out How They Do".